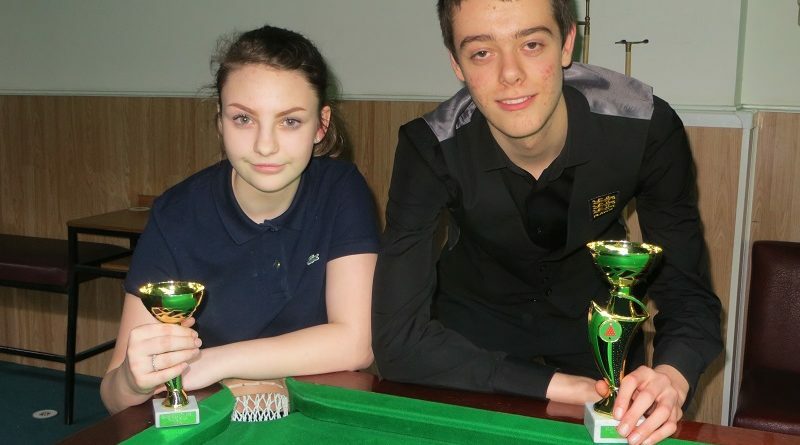 THERE was a double celebration in the Cowdroy household following the sixth legs of the Cuestars Under-21 Gold, Silver and Bronze Tours at Greenbaize Snooker Club, Bournemouth. While Adam was winning his first Bronze tournament, big brother Bradley collected the Plate trophy. Home player Bradley, the England under-16 captain and Gold Tour rankings leader, failed to qualify for the knockout by one frame. But the 16-year-old Premier Junior Tour player went on to beat Katie Griffin in the final of the competition for non-qualifiers. Katie, from Swindon, is currently fifth on the Bronze Tour and received a 28-point handicap start. PRELIMS: Bradley Cowdroy (Greenbaize, Bournemouth) beat Zak Truscott (Waterlooville Sports Bar), Katie Griffin (Jesters, Swindon) beat William Thomson (Chandlers Ford SC), Harry Wilson (Waterlooville Sports Bar) beat Sam Walter (Mayfair, Gosport). SEMI-FINALS: Cowdroy beat Chloe White (Waterlooville Sports Bar), Griffin beat Wilson.